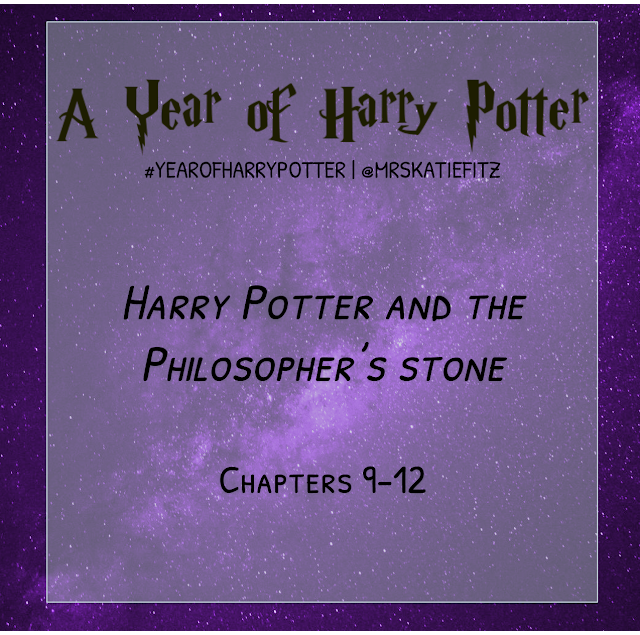 This past week I read chapters 9 through 12 of Harry Potter and the Philosopher's Stone: The Midnight Duel, Hallowe'en, Quidditch, and The Mirror of Erised. Spoilers may appear in my commentary. This segment of the book introduces us to the first instance where Harry misbehaves but escapes the consequences of his misbehavior. The fact that Harry is often rewarded for breaking rules came up in a discussion with some other homeschooling moms recently, so I was definitely looking for it, and it will likely be something I touch on in these posts as I read through all the books. In this first instance, Harry disobeys Madam Hooch by attempting to fly on his broom without supervision or permission. Instead of disciplining him, however, Professor McGonagall, who catches him in the act, puts him on the Quidditch team and praises his abilities as a seeker. What I thought immediately, especially given the reactions of all the adult characters in the wizarding world to Harry's return in the last set of chapters, is that it has to be tempting for these authority figures to give Harry a pass each time he does something wrong. Not only is he a hero for apparently vanquishing Voldemort, but he has also had such a tough time, losing his parents and living with the Dursleys for so long. I can imagine them wanting to look the other way just to make his life easier. I'm curious as to whether I'll be able to apply that theoretical explanation to any of the characters as Harry's disobedience becomes more flagrant over time. The other thought I had is that characters who are special in a variety of different ways are annoying to read about. I couldn't stand it in the Twilight series when Bella Swan was constantly being discovered as the only one who could do this or that rare thing. I hate it when Nancy Drew comes to the rescue of some friend of hers because she happens to be really strong, really brave, and really knowledgeable about some rare medical problem at the same time. And there is something grating about Harry going from rags to riches, and then on top of that, having such a talent for Quidditch, and later, being allowed special privileges such as participating in the Triwizard Tournament. I can't say it doesn't work in these books, because I love the series, and I enjoy reading about what happens to Harry as a result of his specialness. But there is also a reason my favorite character is Ron. Speaking of Quidditch, though, I am still impressed by how well Rowling developed this fictional sport. Lee Jordan's commentary during the first match of the year sounds like the soundtrack to a real football or basketball game, and it really helped me visualize everything that was happening on the Quidditch pitch. I also loved the line that compares the hoops of the pitch to the wands children use to blow bubbles. That image really brings the whole concept to life for me. Finally, I found the Mirror of Erised chapter especially poignant in light of what Rowling has said Dumbledore really sees in it. ("He saw his family alive, whole and happy – Ariana, Percival and Kendra all returned to him, and Aberforth reconciled to him.") The fact that he takes the mirror away to a place where Harry can't find it suggests that he has learned the hard way, firsthand, how damaging it can be to spend time dwelling on what might have been.